Ultra rare opportunity to GUT RENOVATE this approximately 2400 sq foot apartment at one of New York's most renowned post war cooperatives, The Sovereign. Buyers seek out the high floors of the Sovereign's towers for the breathtaking views. The 42nd floor D line boats south and west exposures that capture the iconic Chrysler and Empire State Building, the majestic new Freedom Tower, the entire width of the East River and a clear view of the Verrazano-Narrows Bridge in the distance. All of the city's beauty can be taken in from the sizable terrace off the living room. From the north and east in the master bedroom, your river watching continues with unique views of the newly renamed RFK Bridge and most of Roosevelt Island. The apartment layout currently features an entry foyer with half bath, kitchen with laundry, dining room, living room with den and full bathroom, and a master bedroom with en-suite bath and decadent, mirrored closet/dressing area with display cases. One can easily convert the unit back into a two bedroom. The Sovereign was designed by Emery Roth and Sons, who also created other famed NY buildings - The Beresford and The San Remo. The elegant and impressive lobby has soaring ceilings accented by the sparkle of hand blown 1950's Venini chandeliers, designed by the Italian Architect Carlo Scarpa. There is a renovated gym and white glove, luxury service from a well trained staff of doormen, porters and mechanics. The 24 hour garage with valet service gives you the extraordinary convenience to drop your car off right at the front entrance. Storage available for an extra fee, space permitting. Sutton Place is a sanctuary away from the bustle of the city. Its quiet and serene streets are lined with trees and small, intimate restaurants. 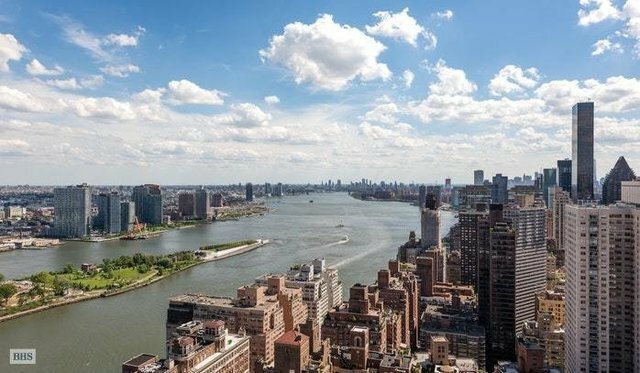 You are moments from the East River Promenade, a Whole Foods on 57th Street, renowned schools, and the main shopping centers at Lexington Avenue.